The Cottage sleeps up to 4, and offers everything you need to make your stay fun and relaxing. 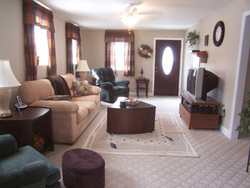 Central A/C & heat, gas log fireplace, washer, dryer, dishwasher & cable TV NO PETS. MINIMUM 2 NIGHT STAY. NON SMOKING.